When a staff member is in the middle of an interview stage with a participant, that staff member has a lock on the interview. This prevents conflicts in storing data. Occasionally, you may need to unlock an interview. For example, a technical problem may be preventing the interview from being released, or the staff member who has a lock on the interview is not able to continue the interview. 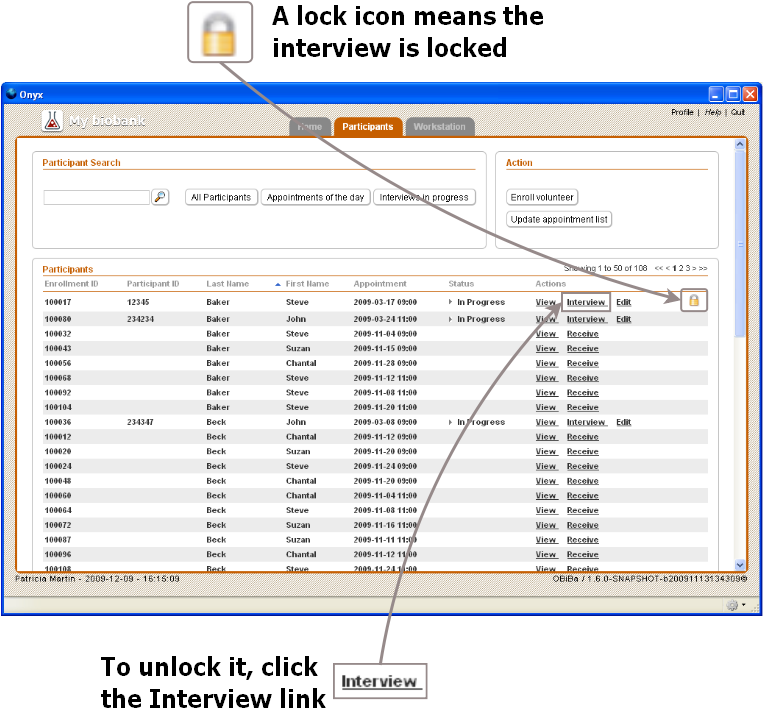 A participant manager can unlock the interview as explained in this section. If the Participants page is not displayed, select the Participants tab to display it. Locate the participant whose interview is locked. See this figure. Select the Interview link for the participant whose interview you want to unlock. A message is displayed asking you to confirm that you want to unlock the interview. If you decide not to unlock the interview, select the No or Cancel button. The Participants page is visible displayed. The interview is still locked. To unlock the interview, select the Yes button. The Interview page for the participant is displayed. To allow another Onyx user to work on the interview, select the Exit X button. The Interview page closes. The Participants page is visible displayed. The interview is unlocked.